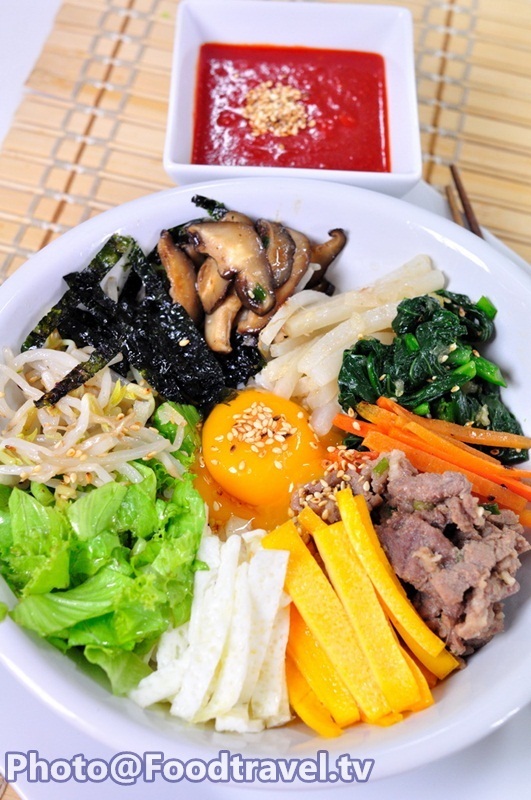 Bibimbap - Korean salad that we ever find at Korean restaurant. But today we no need to go outside , wasting time with traffic or have to pay for it. Today we will cook it together. Not too hard for this Korea menu. The yolks and whites are for decoration. 1. To separate whites and yolks apart. All the eggs of two eggs. 2. Add salt to taste, egg whites and yolks and beat to combine. 3. Heat oil in a wok over low heat pour over the egg yolks into the hot pan. Until the yolk is cooked throughout. And let it cool down. 4. Heat oil in a wok over low heat, then pour the beaten egg whites into it. Sift over the pan. Until the whites are cooked through.And let it cool down. 5. The yolks and whites are already fried. Cut to size and decoration. 1. Beef, cut into small pieces and then slide into a mixing bowl. 2. Add onions spun a Cht. Cht trolley ride one. Smoothies, ginger, garlic and a little spin 1/2 Cht. Treacle 1 Cht. Cht an onion. Cht soy sauce 1. A little sesame oil. Mix the ingredients together. Marinate it for about 10 minutes. 1. Set the pan on high heat, add vegetable oil and sesame oil 1 tsp. for each. Add sliced radish, salt just a little and blended garlic. Stir until radish cook and set aside. 2. Set the pan on high heat, add vegetable oil and sesame oil 1 tsp. for each. Add sliced carrots, salt just a little and blended garlic. Stir until carrots cook and set aside. 3. Put Shiitake mushroom into a mixing bowl. Add 1 tsp. soy sauce, 1 tsp. sesame oil and mix well. Add spring onion and slightly syrup if you like sweet taste. Stir until mushrooms is cook. Then set aside. 4. Set the pan, add oil, stir-fried marinated beef until done. Set aside. 5. Put blanched sprouts in a blender, then add salt, sesame oil, roasted sesame, spring onion just a bit for each. Marinade all ingredients together by hand. Then set aside. 6. Put blanched kale into a mixing bowl, follow with garlic, soy sauce, sesame oil, roasted sesame just a bit foe each. Marinate ingredients together by hand. Then set aside. 7. Put shredded lettuce into mixing bowl. Add 2 tsp.vinegar, 1 tsp. syrup and mix well together. 1. Add 2 tbsp. 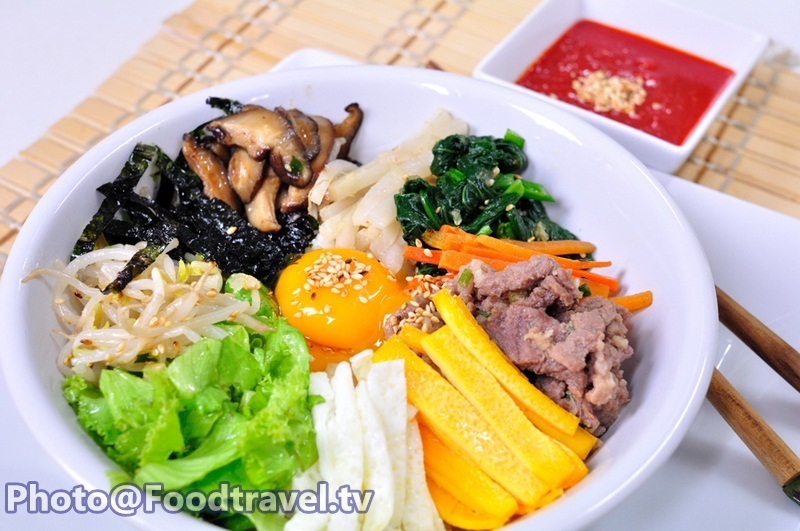 Kochujang into a bowl, follow with 1 tbsp. blended Chinese pear, 1 tbsp. blended onion, 1 Tbsp. blended garlic, 1/2 tbsp. syrup and 1 Tbsp. sesame oil. 2. Mix all ingredients well. Set aside at least 10 minutes and you’ll have Kochujang sauce. 1. Put cooked rice into a deep bowl. 2. Arrange ingredients just a bit for each one. Decorate beautifully. .
3. Finally, put fresh yolk egg in the middle. Add seaweed, sprinkle with sesame into the yolk slightly for beautiful. 4. Serve with Kochujang sauce. 5. Mix Kochujang sauce with rice all over before eating. Ready to eat.